What Are The Best Sunglasses for Round Faces? Ever wonder, “what are the best sunglasses for round faces?” The answer is simple: For round faces, find frames that are rectangular or square. Certain facial features accommodate certain eyewear styles, so pulling off the look you want requires you to know what’ll look best with your unique face! Want to learn more? This little guide will teach you how to find the best sunglasses for round faces. Take a peek. How to choose the perfect sunglasses for round faces? This brief guide will teach you how to choose the perfect sunglasses for round faces. By learning whether or not you truly have a round face shape, which styles work best, and which styles to avoid, you can finally your perfect pair — a frame that matches both your facial shape AND your personal preferences. Step in front of the mirror and take a look for yourself. People with round faces have a fuller shape to their cheeks, which often gives them a more youthful appearance. Following that, they also have foreheads that are wider at the top rather than narrow. Another tell-tale feature is that, nearing the bottom of the face, people with round faces usually have rounder chins than other face shapes. In some cases a more subtle jawline is also a good sign. 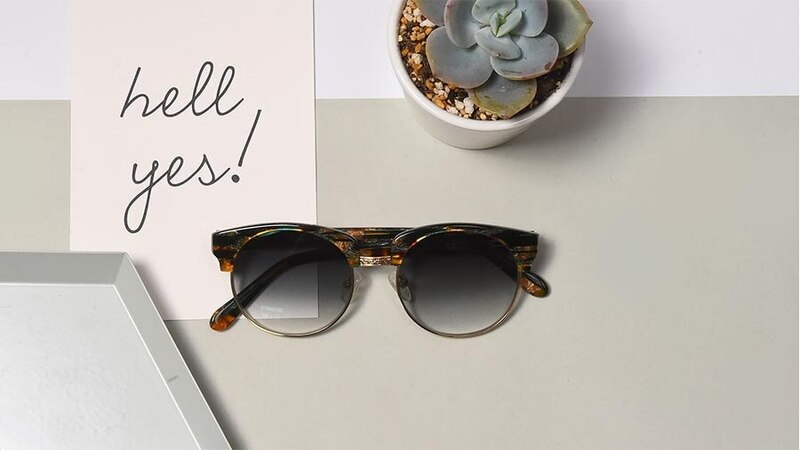 If this sounds like it describes you, get ready — EyeBuyDirect has hundreds of excellent sunglasses for round faces just for your face shape. What types of sunglasses look good on round faces? Tortoise shell is such a versatile concept in eyewear. Getting sunglasses in this time-tested style is a sure-fire way to improve any outfit. Different hues and patterns, plus frame styles, can create a vintage, modern, or classic look. Most of the best sunglasses for round faces are square, because of the way geometric shapes add strong, angular lines to a face. Dark colors and thicker full-rimmed frames amplify that effect even more to make your face look sharper. Wayfarer sunglasses feature bold angles that can give contrast to any round face. They're a fashion forward classic, so don't hesitate to try them out for yourself. Square sunglasses are bold and expressive. The strong lines and angles they feature make them a perfect fit for any round face. If you want to go the extra mile, try getting them in a fun floral pattern. You can even find them in metal styles! Certain facial features accommodate certain eyewear styles, so pulling off the look you want requires a bit of fashion knowledge. While it's important to know which sunglasses are the best for round faces, it's also good to know which you should avoid. People with round faces should stray away from sunglass frames that are oval or round. These types don't give any contrast to your face, and might give off the illusion of being more round than it is! With the EyeTry feature, it's super simple to virtually discover which sunglasses will bring your look to whole new level. Start by clicking on any pair of frames that catches your eye. Then, hit the "Try On" button to get started. All you need to do next is upload a photo of yourself to see how you might look in the glasses you chose. It's that simple. Take a peek below at our selection of trendy sunglasses for round faces and find your perfect pair today.